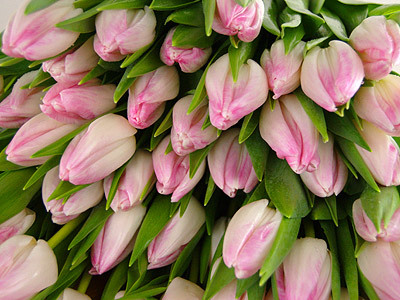 Send 20 Pink Tulips for UK flower delivery from Clare Florist. 20 stems of top quality, fresh crisp, vivid Pink Tulips - freshly picked and then simply presented within layers of fine tissue paper. As with all of the flowers in our, flowers under £35 range, these 20 stems of pretty Pink Tulips arrive ready for you to arrange in your own vase. Pink Tulips are symbolic of good wishes and happiness, making this beautiful bunch the perfect gift to express thanks, congratulations, or good luck. They could also make a nice alternative to roses as a romantic gift. Show that special person how important they are with the 20 Pink Tulips - beautiful tulips for only £24.99 including standard delivery to any address in the UK! Have these flowers delivered 7 days a week throughout the UK. Your flowers will be delivered in our special delivery box to prevent damage while in transit, so they arrive in excellent condition all for just £24.99! For that extra special personal touch, why not a box of delicious Lily O'Briens Chocolates, a cuddly teddy or a Handwritten Card to say thank you. We also have a large selection of flowers under £35 as well as many arrangements containing tulips and an array of different gift sets to suit every occasion.